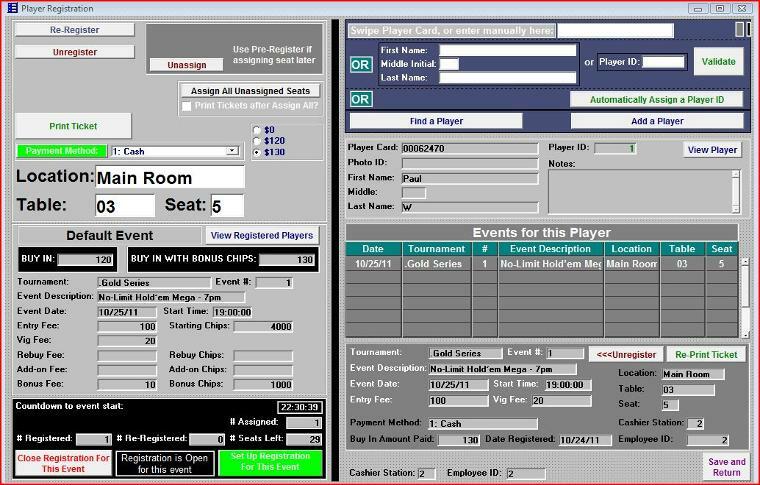 “The Registration”, poker tournament registration software, years in the making, developed with the help of the best tournament directors in the business. Flexibility was the number one priority to ensure that you can run your registration exactly the way you like. Like to hold back a seat at each table until you need them? No problem. Want the ability to choose a specific seat at a random table to accommodate special needs or separate a couple? No problem. Want to let players choose smoking or non-smoking? No problem. Want the ability to manually assign seats, register but assign seats later (such as when a player wins a super satellite), assign more tables as you move along, add or remove tables from inventory, register players for more than one event or reregister them for the same event? 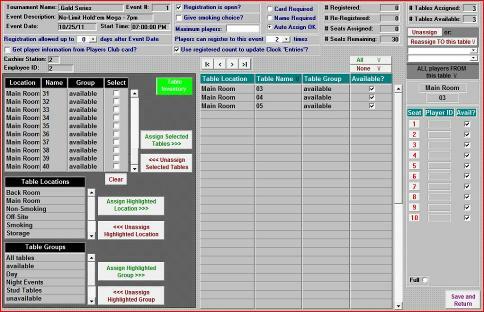 “The Registration” poker tournament software allows you to set up and change your table inventory whenever you like. Using ‘Locations’ and ‘Groups’ you can sort your tables into specific collections. So for example, if you usually run daily tournaments with just a few tables, you might give them a location of ‘Main Room’ and a group of ‘Daily Tournaments’. But then you might have occasional large tournaments with tables that you might specify as location ‘Ballroom’ and group ‘10 seat tables’. 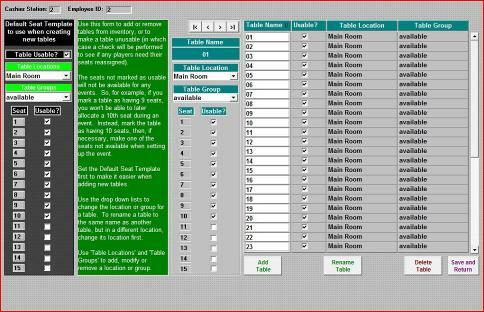 Now when it comes time to run your big tournament, just select ‘Ballroom’ and with one click allocate all of those tables to the event. 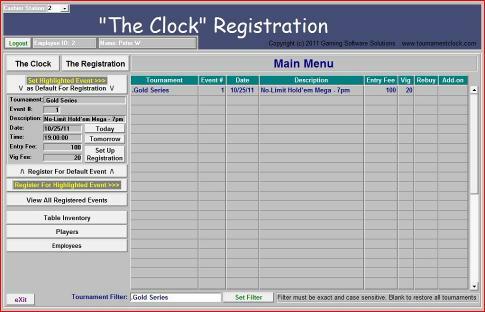 “The Registration” gives maximum flexibility when setting up your events. If players must use a Player’s Card to register then you can force that option. Or you might require just their name, or maybe you have no requirements so can just automatically assign a temporary Player ID. A simple click defines the rules for your card room. Maybe you allow players to re-register for an event, or maybe you have limited seats so have a maximum number of registrations. Again, the flexibility is built right in. Move up to “The Registration” Pro Edition and now you can network together several cashier stations. You can also enhance the card swipe by having the option to get player details from the Players’ Club on your server, so when a player registers with his or her card, you can automatically retrieve their name and whatever other information you’d like. You can also add security levels for your employees, so for example you could set up a ‘Junior Cashier’ level that cannot manually assign seats. Already own “The Clock” Pro Edition? Now you can automatically update the ’# Entries’ based on registration counts, and once the Clock has calculated the payouts, you can distribute those prizes to the players back in “The Registration”.